Starting a new exercise program often feels like a challenge, but the thrill of initial success may motivate you to train more and more. Unfortunately, some people begin to exercise too much and cause themselves injury. 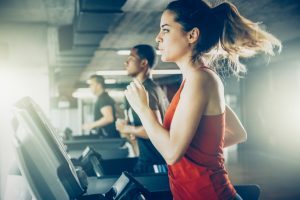 Jacksonville orthopedic specialists recommend listening to your body to know when you’re exercising too hard. The amount of physical activity a person can comfortably tolerate depends on a variety of factors, including body shape, weight, and cardiovascular health. In general, the American College of Sports Medicine recommends that adults aim to get 30 to 60 minutes of moderate-intensity physical activity at least five days per week. This might include brisk walking, jogging, swimming or cycling at a moderate pace. For those who train more intensively, 20 to 60 minutes of vigorous intensity exercise also fulfills this requirement. In addition to aerobic exercise, sports medicine experts recommend that adults engage in resistance training at least two days per week. Training each major muscle groups helps increase muscle mass and prevent loss of strength. The American College of Sports Medicine emphasizes that each individual should gradually progress to increase time spent exercising. For someone with a sedentary lifestyle, beginning with the recommended 150 weekly minutes of moderate-intensity exercise may be too much, too soon. Beginning slowly before increasing the frequency, time and intensity of exercise can prevent injury. Technically, there is no upper limit to the number of minutes that can be safely spent exercising each week. Competitive athletes such as Michael Phelps or Lance Armstrong spend considerable time training without ill effects. However, some scientific evidence suggests that too much exercise may be harmful. For example, exercising longer than 60 minutes may temporarily stiffen blood vessels and decrease antioxidant levels. Exercising for too long may also affect the heart, increasing the risk of a myocardial infarction. Of course, one of the biggest risks of overtraining is injury. Exerting yourself at a higher intensity than usual may provoke a bone or joint injury, requiring physical therapy. When considering your exercise routine, listen to your body. If you feel a nagging pain or worry that you’re reaching the limits of your physical exertion, reduce your exercise intensity. Building in a recovery period into your training schedule will also help you prevent negative effects of exercising too much.